Arts & Science of Sign Design – Signage Foundation, Inc.
To be an effective form of communication, signs must incorporate sciences behind artistic design principles. Any regulation must also take these factors into consideration to ensure that signs are both effective and safe. This document includes some of the latest research into applicable scientific principles. About The Signage Foundation, Inc. The Signage Foundation, Inc., is a not-for-profit, non-partisan organization dedicated to fulfilling the educational, research, and philanthropic purposes of on-premise signage. SFI was established in 2002 as a 501(c) (3) public foundation through its supporting organizational alignment with the International Sign Association. The Foundation is governed by a board of directors representing the diversity and professional depth within the large community of individuals that believe in the social and economic value of on-premise signage. The Signage Foundation, Inc. affirms signage as a fundamental component of today’s communication system and as a necessity for the development of a visually pleasing, economically healthy, and diverse community. The Signage Foundation promotes intelligent and productive use of on-premise signage and storefronts that benefits every sector of the U.S. economy. The Signage Foundation, Inc., is committed to expanding the knowledge base on the use and benefits of signage products through peer-reviewed research to facilitate the operation within the marketplace by manufacturers, suppliers, and individuals in their efforts to design, build, and sell innovative products. Each fall, The Signage Foundation hosts the National Signage Research and Education Conference in conjunction with the University of Cincinnati’s Colleges of Design, Architecture, Art, and Planning, and Business. While SFI commissions original research and publishes the results as original treatises, in the interest of promoting signage information to a broader audience, it also condenses and republishes (with permission) existing articles and studies. The following article has been adapted and updated from a version that originally appeared in the 1997 “Economic Value of On-Premise Signage,” published by the California Sign Association (formerly the California Electric Sign Association) and the International Sign Association. In just a few words, signs convey a lot. They draw attention, communicate a message, compete with surroundings, and reach a driver whizzing by. But signs are more than an artistic endeavor. The best blend strong design and graphics with a thorough understanding of the science that makes them most effective. Sign regulations, too, must balance artistic expression with scientific research. Otherwise, the end result could be harm to a business or, worse yet, an unsafe distraction for drivers. The Federal Highway Administration has developed numerous principles to ensure road signs are safe. While the FHWA’s information is aimed at highway signs, the agency includes research that can apply to on-premise signage as well. For instance, the FWHA has determined that 41 percent of accidents occur because of a lack of adequate signage. Further studies have established that the most important consideration in determining the size and placement of a sign is the distance between the sign and the viewer. Consequently, one blanket sign ordinance is rarely enough to meet the diverse needs based on viewership or location. A sign will not be viewed by any driver on its own. It will be seen in the context of other structures, landscaping, and visual sight lines in the area. Because of its very nature, on-premise signage is located further away from the roadway than traffic signs. It sits on the property of the sign owner, beyond the lanes of traffic and right-of-way. Signs must be high enough to be seen beyond obstructions, such as cars parked alongside the street and on the roadway. If a sign is visible from a greater distance, it affords a longer viewing time and is better able to develop an impression. At 55 mph, the viewer travels 80 feet per second. It takes 16.5 seconds to travel a quarter mile. There is little time to draw attention from the road and redirect it to the sign. If the sign is to be seen by drivers, the speed at which they are traveling is also a factor. Drivers must have time to read the sign, process the information, and safely react. This is called the Decision Sign Distance (DSD) and varies depending upon the rate of speed on the street. A driver must have adequate time to react to the sign, decide to take action, and then safely complete the maneuver. If there are a number of signs in the area, drivers may need additional time to respond. To be most effective, the sign’s design must accommodate the location as well. The size of its letters will be affected by how far the sign is from the viewer. It also will vary according to the intended viewer: a pedestrian or a driver. But other elements can influence the sign reader’s ability to comprehend. Signs that feature familiar logos, words, and fonts can be processed more quickly. Because of familiarity, for instance, the current McDonald’s sign features only its name and the iconic golden arches. Nowhere on the modern version of the sign does it say “hamburger” or “restaurant,” as it once did. Familiarity allows viewers to fill in those blanks because they know the name and the logo. Color: Color is recognized as part of a corporate logo. Studies have shown that 80 percent of the recognition of a trademark is due to its color. Whether it is an iconic, international brand or a small local store, viewers will recognize the sign in part because of the colors used on it. Luminance: Color bears another important aspect of sign design. Each color reflects a specific percentage of light striking its surface. This is known as luminance. The chart below shows how various colors rank on the luminance scale. When signs are internally illuminated, those that have a higher luminance scale show brighter. Light emitted from a light source, such as neon or LEDs, also has varying degrees of brightness. 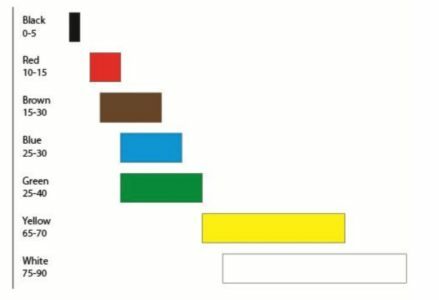 They are, in order, dimmest to brightest: red, blue, green, and yellow. This is known as luminescence. For drivers traveling at night, both the reflected light—luminance—and illuminated light— luminescence—factor into the readability of the sign. Contrast: Most signs include words and objects that are a different color than the background. The contrast between these two items also affects the readability of the sign. This occurs at two points: the exterior and interior of the sign. Exterior contrast compares the sign’s edge to the background against which it must be viewed. This might be how the sign’s design fits into a multi-tenant sign, or how the sign’s edge meets the building to which it is affixed. The same requirements apply to the interior of the sign—where the copy meets the background. White letters on a yellow background will not be nearly as striking as white on black, for instance. Size: The larger the letters appear, the better. 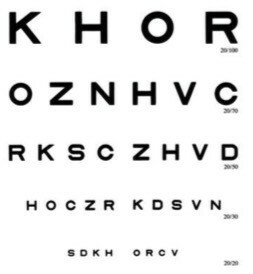 The copy of the Snellen eye chart (right) certainly illustrates the relationship between the physical size and the dramatic visual impact. When a sign must be read easily in a minimum amount of time—such as when traffic passes by at a high rate of speed—it is important that the words be large. To be readable—and to convey its message safely—a sign must be detectable, conspicuous, legible, and comprehensible. A sign reportedly should be 40 feet of distance per inch of letter height, which allows for maximum comprehension and legibility day and night. Lettering on signs should include strokes— measuring the thickness of the letters—that are one-fifth the letter height for maximum readability. Signs intend to communicate with a viewer, of course. But sometimes, viewer limitations get in the way. It has been well documented that the American population is aging. In 2011, 13 percent of the U.S. population was over age 65 and by 2025, about one in four drivers is expected to be over 65. Eyesight declines with age, and reaction time slows. It is estimated that 66 percent of American adults wear glasses, contact lenses, or both. As many as 3 million people have glaucoma, and cataracts affect 22 million people over age 40. Most of us see more poorly in low-light conditions. To compensate, signs must be designed to provide better visibility, especially at night. No matter the age, though, all drivers have a relatively narrow cone of vision. Signs must be positioned within this cone so that the driver doesn’t need to take his eyes off the roadway to take in the sign. The Manual on Uniform Traffic Control Devices—the federal government’s standards for signs and signals along America’s roadways—sets a maximum height for traffic signals. It is based on the concept that viewers sitting at an intersection can see about 20 degrees from the driver’s eye height. Anything else could be lost in the upper portion of the windshield. While these standards apply only to signals and road signs, the science applies to on-premise signage as well. If the sign isn’t positioned correctly—or its orientation to the roadway is increased dramatically—it may be illegible if the sign isn’t large enough. But for signs to be the clearest, the cone is somewhat more narrow. The absolute clearest viewpoint is a cone of about 3 degrees around where the eyes are focused. Readability is severely limited outside a 10- degree cone. Jourdan, Hawkins, Abrams, and Winson-Geideman, A Legal and Technical Exploration of On-Premise Sign Regulation: An Evidence Based-Model Sign Code, 2009. 10. Weinstein, Hartt, A Framework for On-Premise Sign Regulations, 2009. The Signage Foundation, Inc., has developed document that incorporates all of these factors. To receive a copy of A Framework for On-Premise Sign Regulations, visit www.thesignagefoundation.org. This entry was posted in Business Signs, Commercial Signs, Monument Signs, Sign Design by BSM Staff. Bookmark the permalink.